Cities Connection Project | STUDENTS HOUSE. GENEVA. 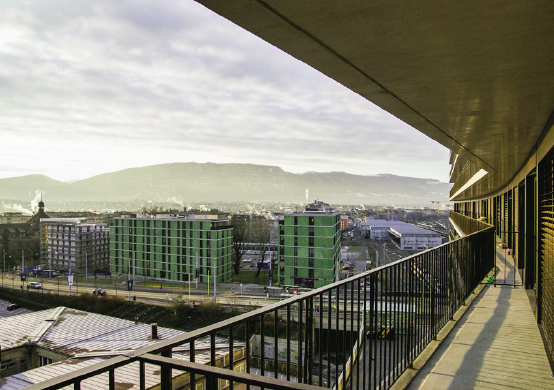 Situated at the entrance of Geneva, the Edgar and Danièle de Piciotto Student House is open to the world. The shape of the building is a broken bar having one long side aligned with the tracks of the railway. 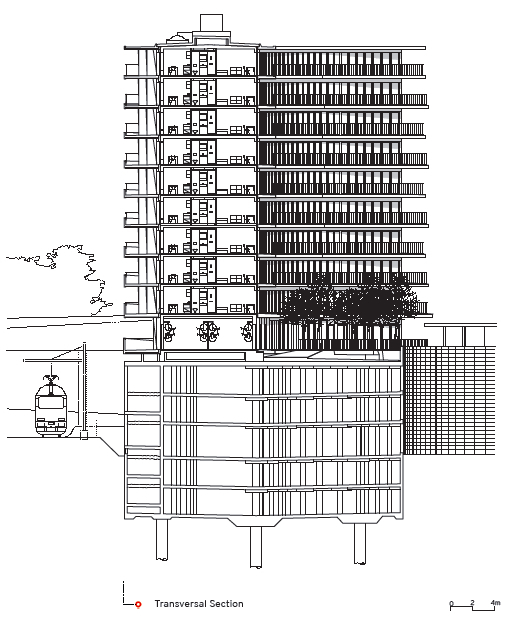 The facade consists of private balconies on the east and the large outdoor gangways (“coursives”) to the west. It expresses a superposition of big horizontal slabs which equally function as filters against the sun and noise. The height of the parapets varies depending on the angle of incidence coming from the noise of the passing trains. This principle enriches the building with a facade that progressively lightens itself to the sky. The building opens itself to the panorama of Geneva, like an open hand, and generates a semi-private garden right at its foot. The garden is situated along a public promenade. All apartments are double oriented. All the private rooms arelocatedonthequieter,easternsidebenefittingfrom the morning sun and the tremendous view on the lake and the Alps. All common spaces are situated on the western side towards the collective outdoor gangway (“coursives”). These gangways are external meeting places as well as decks of a ship from where you can overlook the fascinating spectacle of trains entering and leaving Geneva. This housing building tries to create a dialogue with the city and the international institutions through its simplicity, form and the set of scales.